When we spoke to composer Omar Akram his ten-month-old daughter, Aria, was at his side chiming in with appropriately timed coos and giggles. It was only fitting since his Grammy-winning album "Echoes of Love" was partly inspired by her. But the Afghan-American artist is also influenced by his travels as a child and his love of art and culture. Omar was born in New York but spent much of his childhood away from the U.S. because his dad worked for the U.N. His parents, both from Afghanistan, brought their young child back to live in their homeland for a time as a boy. Then they moved to Prague, then off the France and finally to Cuba before returning home to New York. Omar was a self-proclaimed hyper kid and his parents found that the only thing that could calm him down was classical music. And so the piano lessons started at age six. He admitted they bored him at first but in a recent exclusive interview he said, "When my teacher would leave after the piano lesson that's when I would have a good time tickling the ivories." His love of piano grew and he was composing by age 13. He was already being influenced by a wide variety of music from the classical in Prague, to the electronica in France, to the Latin beats in Havana and even the King of pop Michael Jackson. 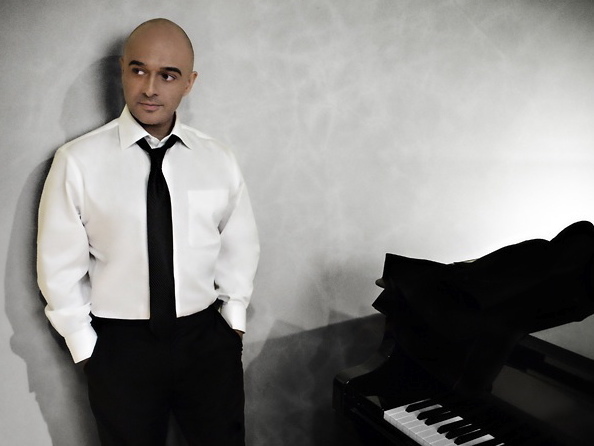 He describes his music saying it is, "a combination of different culture coming together with my classical background. It's instrumental music and at the same time being influenced by world culture." One advantage Omar has that he thinks contributes to his global appeal is the lack of lyrics. He is not bound by language or meaning, but instead can unite with the emotion of the instruments. He was particularly thrilled to win the Grammy this year and put forth a positive image of Afghanistan to the world. He recalled, "As I was accepting the Grammy Award I was thinking about being the first Afghan American to ever win a Grammy. Overnight that became a huge story back in Afghanistan. And then other media outlets throughout the world picked it up and it became big news." He continued, "It means a lot to me, because that country has gone though so much. Basically all you hear about that country is war." At this point Aria interrupted with some appropriately timed wails, which we interpreted as her dislike of war. Her dad could not agree more. She stated, "Something that positive coming out of somebody with Afghan heritage is really incredible. Afghanistan is divided in to different ethnicities that makes up Afghanistan. That's one of the reasons you have war all the time because they can't agree on a lot of things. So this was one thing that I heard from different factions of the country and everyone got behind this Grammy win. In a sense it united the country. And I was really pleased to be a part of it." Omar told us he is most passionate about art in general. He noted, "I love culture. Every chance I get, I go to the Getty Museum. I love going and looking at art whenever we can. Art inspires me and it has inspired music in me in the past." He is also a fan of director David Lynch and if he could walk in the shoes of one pop culture icon, that is who he would choose. "He's a filmmaker, but he's an artist. He sculpts, he draws, he does music and he also directs films. I'd say for one day I'd like to be David Lynch. Find out more about Omar at his blog and watch for us upcoming album in August, which will feature five tracks from his four previous albums and six new tracks.